Hi! My name is Grace Horsefield, and I have had the amazing opportunity to serve as this past year’s Crawford County Fair Queen. At the 2018 fair, I had ‘Barrels of Fun’ watching kids from all over the county care for, and show off their livestock, and projects that they’ve spent so much time working on. One of my favorite parts of the week was getting to interview the tiny humans at the Prince and Princess contest. It was really fun for me to embrace my inner Steve Harvey for a little bit! I also got to be a part of the teen pageant where I met many young women who are so filled with love and laughter, that their positivity was absolutely infectious. I know these beautiful young ladies are going to be some of the most passionate, strong leaders someday! I also got to speak on two different radio stations, which was very out of my comfort zone, but it was just a tiny slice of the huge pie that makes up all of the cool experiences I’ve had! It was a humongous blessing for me to be selected for this role. I’ve grown up at the fair, and have always looked up to those who have ran before me. This was an opportunity for me to return the favor, and continue to stay involved in my community while setting an example of a genuine, kind, glamorous girl in Crawford County! Since the fair ended, I have been able to come home from college on several occasions to continue serving Crawford County. I’ve gotten to participate in the Steelville Harvest Festival parade, (don’t worry, none of the princesses involved melted in the rain!! ), and also both the Cuba and Steelville Christmas Parades. I was so excited to attend Pancakes with Santa at Frisco’s in December, and also helping at Cuba Fest in the fall, and Running the Rails on Route 66 this spring. These were definitely some of the highlights of my year. I love getting to know the people from our small community, and make connections that lead to some awesome friendships. There are so many people that I need to thank in so many ways for supporting and encouraging me this year. First and foremost I need to thank the fair board members for all of their hard work, dedication, and also for putting together the most beautiful (AND WARM) parade float for the Cuba Christmas Parade! This experience was so much fun because of the gorgeous girls who competed with me. I will always cherish all the support I received from them, and adore each of these women from the bottom of my heart! Danielle and Amie were fantastic from our very first informational meeting, and worked their tails off to make sure each of the contestants was not only confident in who they were, but also making sure that we were having fun and building friendships along the way. Without their guidance, I would not have had the courage to get up on stage and not only compete, but enjoy every minute of it! Of course, I need to thank the people who gave me life, as well! My parents have been my rock for my entire life, and have always worked their hardest to be an example of genuine strength mentally, emotionally, and spiritually. I would not have had the confidence to even enter the competition without the motivation coming from my mother, and oldest sister. I truly would not be the person I am without the guidance of all of my family and friends. I have loved every single minute of serving as this past year’s queen! I pray for wisdom and direction for, and wait anxiously to see all the wonderful things the next recipient accomplishes! Thank you for the continued love and encouragement, and don’t forget to come watch some beautiful, talented young ladies step out of their comfort zones, and witness all the hard work the 4-H and FFA members put into their projects at the 2019 Crawford County Fair! Entries shall be made no later than June 3, 2019. All talent must be performed the Tuesday night prior to the pageant. If talent is not performed that night, the points for talent will be forfeited with a score of zero for the talent portion of the contest. Talents may not be changed 72 hours prior to the talent practice. Participation in all practices IS mandatory. All materials used in the talent portion must be present and functioning properly at the time of practice. Conduct that is found to be improper and detrimental to the Crawford County Queen Pageant and the Crawford County Fair Board will be reasons for dismissal and/or disqualification. 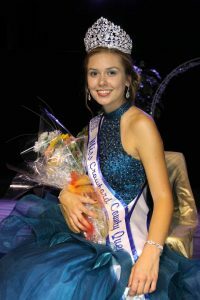 The Fair Queen will be asked to make personal appearances during the year at events in the county. In addition to her prizes, the 2019 Fair Queen will receive $100 toward expenses if she competes in the 2019 State Fair. If the Fair Queen fails to complete her term, the title will be passed to the runners-up in the order of their rank, beginning with the first runner-up. Pre-fair outings (excluding talent practice) for the queen pageant are highly recommended, but not required. Being chosen as the Crawford County Fair Queen and her court is an honor, privilege, and a responsibility. You will be expected to represent Crawford County with honor and integrity throughout your reign. As Queen and the court, your conduct will be held to a very high standard. In the event those standards are compromised, there will be consequences, and you could be stripped of your title. Sponsor entry fee is $150 and must be received no later than June 7, 2019. Sponsor is to provide contestant with parade float. 5 additional points will be added per title to the total score of the girl(s) who are awarded Miss Congeniality and Miss Photogenic. In addition to other prizes, the Queen will receive a $500 scholarship to the college or university of her choice.